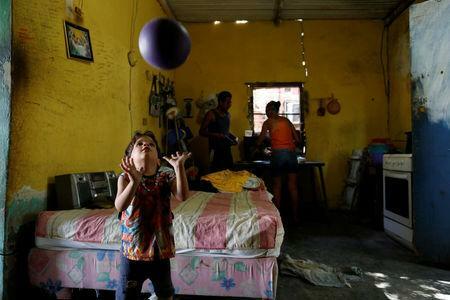 PUNTO FIJO, Venezuela (Reuters) - Struggling to feed herself and her seven children, Venezuelan mother Zulay Pulgar asked a neighbor in October to take over care of her six-year-old daughter, a victim of a pummeling economic crisis. 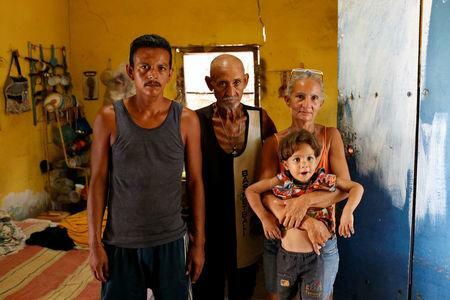 The family lives on Pulgar's father's pension, worth $6 a month at the black market rate, in a country where prices for many basic goods are surpassing those in the United States. With average wages less than the equivalent of $50 a month at black market rates, three local councils and four national welfare groups all confirmed an increase in parents handing children over to the state, charities or friends and family. The government does not release data on the number of parents giving away their children and welfare groups struggle to compile statistics given the ad hoc manner in which parents give away children and local councils collate figures. Still, the trend highlights Venezuela's fraying social fabric and the heavy toll that a deep recession and soaring inflation are taking on the country with the world's largest oil reserves. Showing photos of her family looking plumper just a year ago, Pulgar said just one chicken meal would now burn up half its monthly income. Breakfast is often just bread and coffee, with rice alone for both lunch and dinner. Nancy Garcia, the 54-year-old neighbor who took in the girl, Pulgar's second-youngest child, works in a grocery store and has five children of her own. She said she could not bear to see Pulgar's child going without food. "My husband, my children and I teach her to behave, how to study, to dress, to talk... She now calls me 'mom' and my husband 'dad,'" said Garcia. 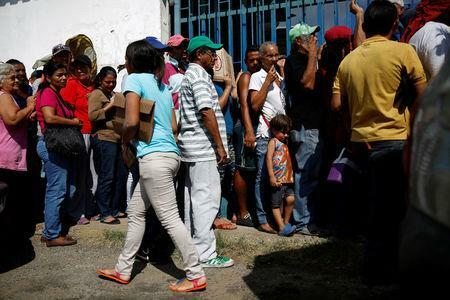 Every day at the social services center in Carirubana, which oversees Pulgar's case, more than a dozen parents plead for help taking care of their children in this isolated, arid corner of Venezuela with a shaky water supply and little food. Last year, the rate was around one parent a day. "The principal motive now is lack of food," said Maria Salas, director of the small and understaffed center, echoing colleagues at two other welfare groups interviewed by Reuters elsewhere in the country. Salas added that her organization - the Council of Protection for Children and Adolescents - lacked the resources to deal with the situation and had asked authorities for help, even just a dining room, but had no luck. Not far from Salas' office, long supermarket lines under a hot sun help explain why parents are finding life so tough, a scene repeated across the country of 30 million people. Venezuelans suffer shortages of the most basic goods, from food to medicine. Millions are going hungry amid triple-digit inflation and a nearly 80 percent currency collapse in the last year. The government blames the United States and Venezuela's opposition, yet most economists pin the responsibility on socialist policies introduced by former president Hugo Chavez, which his successor Nicolas Maduro has doubled down on even as oil prices - the economy's lifeblood - plunged. The Caracas municipality of Sucre, which encompasses Petare, one of the region's largest and poorest slums, has seen an "exponential" increase in parents needing help, say officials. "The parents come in crying," said Sucre welfare director Angeyeimar Gil. "It's very dramatic to see parents' pain when saying they can no longer look after their child," she said. "We're seeing a lot of cases of malnutrition and children that come to hospital with scabies." Two-thirds of 1,099 households with children in Caracas, ranging across social classes, said they were not eating enough in a survey released last week by children's' rights group Cecodap. In some cases, parents are simply abandoning their kids. Last month, a baby boy was found inside a bag in a relatively wealthy area of Caracas and a malnourished one-year-old boy was found abandoned in a cardboard box in the eastern city of Ciudad Guayana, local media reported. Gil said that she had helped find places in orphanages for two newborns recently abandoned by their mothers in hospitals after birth. There are also more cases of children begging or prostituting themselves, according to welfare workers. Abortion is illegal in Venezuela and contraception, including condoms, is extremely hard to find. Back in Carirubana, Pulgar was relieved that her child was being looked after properly by her neighbor. "My girl has totally changed," she said as another son clambered over her, adding that even her manner of speaking had improved. She said she would love to take the child back one day but does not see her situation improving. "This is written in the Bible. We're living the end times."